To represent climate change in experimental modelling, introducing long-term trends and extreme events, there is a need to develop experimental facilities that can better include system complexity and non-linear interactions between system elements. This JRA will tackle the challenge of incorporating complexity in modelling and thus develop protocols that allow holistic assessments of adaptive interventions in hydraulic experiments, providing exportable knowledge about the facilities and benchmark data sets. Improve observational equipment for environmental hydraulic facilities so that key variables at complex boundaries can be reliably resolved. Detailed observations in these complex regions are critical for investigating morphodynamics and biota interactions, poorly represented in present numerical models. Update environmental hydraulic facilities for a range of experiments with mixed grain size sediment and cohesive finer fractions. It has long been known that the “clean” sand used in many facilities does not represent the complexity of the real environment under complex climate conditions. Development of our facilities is vital in order to reformulate, for example, sediment transport equations so that the implications for ecosystem health and services can be fully explored. Improve and adapt environmental hydraulic facilities so that they can consistently incorporate vegetation and biologically active sediment surfaces (including biofilms), which will help quantify the influence of biota and the complex feedbacks with water/sediment fluxes. The ability to incorporate these feedbacks in our laboratory models is vital for novel experiments that will be forced by climate change adaptations. Develop experimental protocols that allow evaluation of complex hard and soft engineering solutions (e.g. combining the addition of sediment with encouraging the growth of reeds or sea grass for a holistic beach nourishment solution) for which no clear experimental methodology currently exists. The observations of different solution “types” and their interactions is a required step to prepare our facilities to evaluate the adaptive interventions needed to cope with drivers from different climatic conditions. Innovative measurement techniques are needed in areas where data acquisition presents special difficulties, particularly under extreme conditions and near boundaries. This can be illustrated by the complex interactions at the water-sediment interfaces (near-bed complex boundary layers), by intense turbulent structures close to moving objects (eddies within a plant canopy), or in areas where biota has been intensively developed (influence of biofilm or vegetation on flow fields). 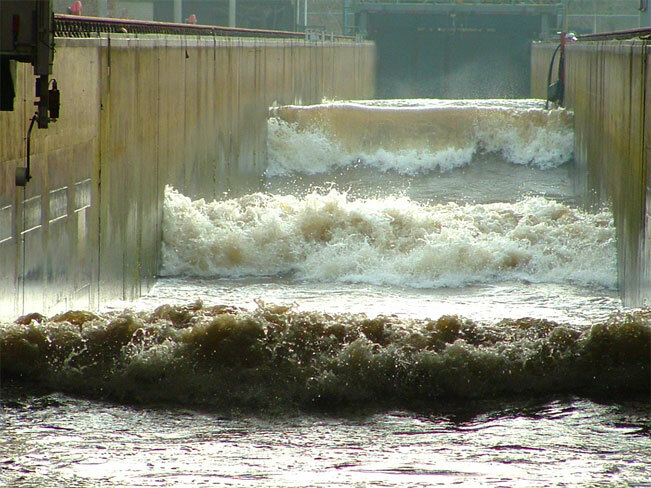 The required measurement techniques should be able to deal with complex flows, high turbulence levels with high sediment loads and moving boundaries. This represents one of the most important challenges in the present state of the art of laboratory modelling. The observational systems considered in COMPLEX will look for high-resolution, accurate and robust solutions, together with limited-cost and flexibility in deployment, with a combination of novel equipment (pulse coherent Doppler velocimeter, with incoherent multi-frequency sediment scattering and acoustic bed interface tracking, used also as an acoustic PIV) and conventional equipment (e.g. large array of pressure sensors or ultrasounds) with development of new sampling and processing schemes (e.g. stereo-videography). This will be provide “redundancy” (e.g. conductivity concentration meters with instantaneous profiling or dynamically tracking capabilities to avoid mechanical repositioning) and “complementarity” (e.g. high resolution stereoscopic swash zone geometry to be used as a PIV for biologically active beds) with equipment robust enough to be deployed in large scale facilities and/or in field campaigns. Most sediment transport experiments performed in environmental hydraulic facilities during the last few decades have been conducted with well sorted, and non-cohesive, sediment substrates. Mixed sediments dominate swathes of coastal, estuarine and riverine environments. Predicting the impact of climate change on rivers, estuaries and coasts requires that these complex substrates are included in experimental models, particularly given that present sediment transport formulations poorly capture the true sediment fluxes in these zones. Moreover, poor prediction often precludes the adaptive engineering interventions that will be required. The work within this task will consist of developing experimental protocols that allow for the explicit incorporation of mixed sediments in experiments (including nourishments with deviating grain size) and applying the novel instrumentation developed in Task 9.1 to more efficient methods that allow morphodynamic thresholds due to bed armouring and cohesiveness to be quantified. This task will therefore deal with the protocols for hydraulic tests with a range of sediment mixtures and the required facility adaptation (for the various sediment sizes), enabling the execution of efficient and quantitative tests and developing the capabilities of facilities and instrumentation that tackle with mixed sediments, which will expand the utility of European hydraulic research infrastructure for these complex substrates. Biologically active and vegetated sediment surfaces have been shown to provide a stronger resilience to wave and current action and can constitute a natural adaptation to varying climate conditions. Interactions driven by biota are also likely to introduce significant non-linearities in system response to environmental change. Including these complexities in experiments presents a challenge to adequately replicate organism behaviour (JRA1 link), where non-intrusive observations of water and sediment fluxes are required along with a quantification of the complex biota effects (e.g. influence of moving vegetation or biofilms). Here we shall be developing experimental protocols for mobile bed experiments that include biota at suitable scales (e.g. patches). We will consider the degree of complexity that needs to be represented in hydraulic models (e.g. simple surrogates versus real vegetation) and the application of novel instrumentation (e.g. stereoscopic optics as PIV, high resolution acoustic profilers or magnetic fluid modification of a ferro-fluid drop) to enable observations in near bed areas and complex boundary regions (e.g. under vegetation or compliant structures) where no measurements have been possible until now. The emphasis will be on optimizing the representation of sediment-biota interactions in experiments and the use of new observational equipment to quantify these interactions. Reponses and adaption to climate change will require the combination of traditional, hard (“grey” or concrete based) engineering structures with novel (soft or “green”) engineering interventions. Including these elements in experimental models requires designing benchmark tests of adaptive interventions with high-resolution observations, allowing a quantitative characterization of the resistant and functional performance. The emphasis will be on the novel, “green” solutions such as artificial nourishment in the submerged or emerged parts of a beach with and without the stabilization effect of ice and selected biota. We shall be also considering the efficiency of the various combinations so as to start incorporating this complexity into a vulnerability analysis for present and future climates. To obtain meaningful conclusions from a limited duration project we shall design a set of complementary tests, aiming to provide a benchmark (linked to the data interoperability and policy from JRA3) for hydraulic research on beach adaptation based on schematized drivers (e.g. future storm durations/intensities under increased sea-level scenarios) and the more resilient combinations of biota and structures/interventions. This will result in an upgrade of environmental hydraulic facilities for adaptation tests, based on the new protocols and instruments (link to Tasks 9.1 to 9.3) that will provide observations at an unprecedented level of resolution at a reasonable cost. The objective assessment of land-water boundary responses to varying climatic factors, with / without structural or biological interactions, can only be performed in facilities with the new protocols and equipment just described (link to Tasks 9.1 to 9.4). Here we shall use the results from beach adaptation tests (Task 9.4) as a case study to develop a holistic protocol for sedimentary responses under present and future climatic drivers: a) with / without structures, b) with / without a biologically active bed and c) with/without ice coverage, including thus the mechanics of synthetic “warm model” ice that could be used at room temperature while representing the main test relevant ice properties. The experimental procedures will seek for cost-efficient instrumental deployment and an assessment of required experimentation intervals. Within the work we will explicitly address the combination of drivers from AR-5 of IPCC, preparing our facilities for the range of projections within the new RCPs (with emphasis on RCP8.5 as a representative high-end family of scenarios). The work will be based on at least two large scales with a mobile (mixed) bed and the presence of a variety of structures, biologically active beds and synthetic ice, aiming to establish an enlarged performance envelope for hydraulic infrastructure. In the COMPLEX-HYDRALAB+ project we shall prepare a dissemination plan for i) the HYDRALAB+ community (since the instruments and facility upgrading will be of direct application), ii) the engineering and physical sciences community (since the experimental data on morphodynamic responses under present and future storms will be of direct application), iii) the public management community (since the river and coastal authorities will directly benefit from the generated knowledge on beach adaptive responses and are expected to be users of the newly up-graded facilities), iv) the private enterprise sector (since e.g. the novel observational systems will provide new opportunities for instrument companies) and v) the climate community (since the quantitative knowledge on beach responses under future climates will provide new information for impact projection presently not available). We shall also address international organizations such as the European Environmental Agency or PROVIA, which are likely to be interested in these new experimental capabilities for impact projection. The dissemination to interested parties will be underpinned by an efficient coordination of COMPLEX partners that have already a well-established track of joint work (paper production, instrument development, exchange of observational equipment and running of parallel tests in 2 or more facilities).